Fresh Pear Gift Box Giveaway! Juicy, ripe pears can add taste, nutrition and style to your cooking. Or you could just eat them as they are—perfect! Five lucky Appetite for Health fans will win our Fresh Pear Gift Box Giveaway. See below for entry details. We know our Appetite for Health friends LOVE pears, so we’ve brought back our popular Fresh Pear Gift Box Giveaway (a $39 value), courtesy of USA Pears and The Fruit Company. We’ve got five of these beautiful Pear Medley boxes (pictured at left) to share—just in time for the holiday season, so enter today! Have you ever noticed that some people are “afraid” of fresh pears. I think I know why. It’s because nobody has ever clued them in on how to tell when a fresh pear is ripe. Therefore, these poor folks have only eaten unripe, hard and less-than-flavorful pears. Don’t be one of those people! Here’s the trick to telling when pears are actually ripe and ready for eating: gently press on the “neck” or stem end of the pear. If it yields to pressure, it’s ripe, sweet and juicy. That’s it. Easy! Pears are one of the few fruits that does not ripen on the tree, so they are harvested when mature, but not ripe. If you’ve purchased pears that are not ripe yet, no problem. Simply leave them at room temperature for a couple days. (If you need them for a recipe on a specific day though, be sure to purchase them a couple days ahead of time so you can make sure they’re ready on time.) Check them daily for ripeness so you catch them at the perfect ripeness. Once ripe, you can slow additional ripening by putting them in the fridge. This is never a problem at my house though because once they are ripe they get eaten immediately. Plus, they usually aren’t all perfectly ripe on exactly the same day. USA Pears are an excellent source of fiber and a good source of vitamin C, with only 100 calories per medium pear. They’re also naturally sodium and fat-free. Try cooking with pears—they’re versatile (and we already know they’re delish). Check out the USA Pears website for recipe ideas (we’ve got one of their holiday dessert recipe featuring pears here). The holidays are coming and pears should be on your table in some way, shape or form. On mine, pears share the spotlight with fresh cranberries and dried cherries in my version of cranberry sauce. If you’d like to try and win one of 5 of these beautiful, 7-pound medley collections in our Fresh Pear Gift Box Giveaway, here’s what to do: First, make sure you’ve signed up for sign-up for our newsletter (no spam ever! ), and be sure to “Like” USA Pears on Facebook , too. Then just leave us a comment below (not on Facebook please) telling us your favorite way to enjoy fresh pears in the fall (in salad? on oatmeal?). Enter by Midnight on Tuesday, Nov. 6th. And don’t forget to tell us where you’ve shared this contest or any AFH content on your social media. The pear giveaway gods like that. Open to residents of the continental US only please. All AFH Terms and Conditions apply. I like to eat them from the fridge while it’s nice and cold. I ADORE pears. My favorite way to eat them is either simply to do so plain or with a little bit of cottage cheese. Mmmm. I love ripe Bartlett pears sliced really thin, sprinkled with feta cheese and glazed walnuts and drizzled with a little fig balsamic vinegar. I’ve already signed-up for your newsletter and I like you both on Facebook. My favorite way to eat fresh pears is just as they are! I also love pears in salads with fresh greens and nuts. Thanks for the giveaway! Love to eat pears in its natural form…just take bite! Shared on fb.=) pick me please! I love them in my salad! I love to create a pear sauce to use over my pancakes – simplycook them slowly with a little water and mash! Baked with oats and dates!! So perfect!! Love pears!! I love to just eat them the way they are! I love to eat pears with sliced cheese – yum, perfect afternoon snack!!! I like to eat them as is. Nothing better than a juicy ripe pear!! I love to eat fresh fall pears in tarts! They become so extra-juicy and caramelized when they get baked in a crisp crust! Email subscriber, Like both FB pages, Shared on my FB wall and tweeted too! Thank you so much! We never realized how wonderful pears are until we got our own place. Neither of our parents enjoyed pears, so they were not available for us to enjoy until we got out on our own and can select our own fruit and veggies. I love to slice pears, and sprinkle with a little bit of cinnamon, bake and enjoy them warm fresh out the oven!! I love them baked, with a spritz of lemon, sprinkled with cinnamon and brown sugar. Or just au natural (the not me)! I like mine several ways. They are great plain (just to eat), awesome in oatmeal or cereal for breakfast, goog with cottage cheese or on a peanut butter sandwich for lunch and for dinner they are wonderful in a salad or with most pork dishes. I love them! I like to put them in fruit salad so that I have a variety of textures and flavors. My favorite way to enjoy fresh pears are to eat them just as they are as an in-between meals snack!! Oh, my husband would be in heaven!!! He loves pears. I wash one every morning and send it with him on his long commute to work because he says he does not have time to eat breakfast before he leaves, but I know he needs some good “nutritional fuel” to break the fast after a 7 or 8 hour night of rest. Occasionally I like to make ginger pear tea. It’s very warm and soothing. WOnderful addition to my fruit intake! Pears are Yummy! Liked/shared on FB and signed up for newsletter. Hope I win! Liked. Liked. Subscribed. Love pears just on their own as a snack. I love pears, and they are the most amazing during fall. I like them sliced thinly on my salads, but more than that I like them cooked with cinnamon, which is my favorite way of all of enjoying pears! Favorite way to enjoy pears is just washed and eaten. I do bake with them, though, snd use them in salads. I’ll share this on FB and twitter. I know I have friends who would love it, especially my best friend’s pear-addict 5 year old! I love to dig a spoon straight into a fresh, ripe pear. The perfect side to hot apple cider. Iiked both and I already subscribe. I love pears just by themselves! They are so good. I to also like them baked with some cinnamon and a bit of equal on them. PRovided the pears aren’t gobbled up plain & perfect as they are, they make a fantastic cobbler – Thicker slices to keep their texture, a little cinnamon and sprinkle of brown sugar, topped with oatmeal & pecans. I use them to make pear pie. The taste is by far better than using apples. I like ripe pears in a spinach salad that includes either blue cheese or feta. Love the sweet and salty combo. reminds me about pears, I am not very good at taking the time to choose fresh fruit, this article gave me helpful reminders. I love them just as they are – ripe, juicy, and sweet! I love to spend the time to dry my own pears. Dipping them in pineapple juice is a great way to dry pears! I love grilled fruit and a grilled pear goes great with porkchops. I love fresh pears and also have a wonderful recipe for a pear upside down cake…the best! Sharing on facebook! Hope to win these wonderful pears!!!! Besides having these as a snack, I love cooking with them and pairing them with lean pork. Pears are also great with cheese. Roasted, then add to field greens with a white balsamic dressing and dot with blue crumbles. There’s not much better than a fresh, ripe pear. I like them by themselves and I’ve also made pearsauce (like applesauce) out of them. Thanks! I like them roasted in balsalmic vinegrette with any salad green and walnuts and gorgonzola. My favorite way has to be straight-up! ..pure pear essence! I like to eat them just as they are. I like a good pear while sitting on the deck. I even love the peel. My favorite way to prepare a pear is to rinse, dry and snack! Those pears look fabulous! I can eat pears about any way. In salads, in oatmeal baked or by themselves. My favorite fruit! YUM! I like pear the way it is … Raw, feeling its juice bite by bite! I like to eat pears sliced and dipped in peanut butter. I like to cut them up and include them in a spinach salad. Favorite way to use pears (other than just by themselves) is to slice them on to an endive salad. I like to just eat them, they are a great snack! I loved fresh pears sliced and dipped in peanut butter. I like to eat them fresh. They are so good,. My parents have pear trees and during the fall I can hardly wait to pick them up off the ground and eat them just the way they are…NATURAL!!! Just eating them fresh out of hand is wonderful, but I love sliced pears in a salad with blue cheese and toasted walnuts! Wow! I’m already a newsletter subscriber, and I like you both on Facebook. Usually I just eat pears fresh but once in a while I like to have a nice pear torte! YUM! Love the juicy pears that are soft and sweet…the juice runs down your chin and your hand…Yea, I’ll take some pears! Already subscribed to your newsletter, just liked the USA Pears facebook page. I love eating pears by themselves, but I also love baking them in the oven! Mmmmm. Love just eating pears straight up or putting them in sangria! Liked and shared and thank you for the opportunity! I like pears baked with a crunch topping. My family’s favorite way that we enjoy fresh pears is all by itself. This is the way you get to enjoy and savor it the most! I already get the newsletter and I follow ya both on Facebook. I like eating pears plain. Nothing fancy. Pears are a favorite of mine and my 4 year old – we slice them into ‘party pieces” and have them for an afternoon snack! My favorite way to eat pears is thinly sliced on a cracker with a slice of good cheese. I love to enjoy fresh pears in my fresh garden salad or as a midnight snack! Absolutely any way, there is no wrong way to eat a pear. But my favorite is probably cut up with a spoon of almond-butter to dip it in 🙂 sooo delicious. I love them many ways: baked and sprinkled with brown sugar, plain with a cheese for a snack, or preserves. I love them baked – not only are they delicious, but you get the added bonus of that wonderful aroma filling your home!! I love pears any way I can get them. My wife makes an awesome pear crisp that doesn’t last long when I am around! I love a pear and cucumber salad. Cold, sweet, and refreshing! We love them just as they are for snacks, in spiced pear tarts, and another fav is sauted with a bit of cinnamon and sugar on top of our pancakes! I receive the email updates from this site and I have visited the USA Pear site and liked it. I grew up with a large pear tree in the yard and my mother made wonderful pear preserves. My favorite recipe is Baked Pears. They are basted with a mixture of honey and Port until almost soft, a spoonful of bleu cheese is placed where the seeds pods were and broiled until the cheese begins to melt and the honey forms a wonderful glaze. Top them with chopped walnuts and serve. This is a decadent desert, but it is wonderful. My favorite way to enjoy fresh pears in the fall is warm on vanilla ice cream with honey and a sprinkle of cinnamon. I love pears in a pear and biue cheese salad because it has a sweet and tangy taste and the pears are sooooo good served this way. I love fresh pears with cottage cheese. I already get your newsletter, and I like you and USA Pears on Facebook! How do I love my pears? Let me count the ways! Fresh off the tree! Sliced, coated and deep fried! Diced and dropped in a fresh green salad with blue cheese dressing! Chopped and added to an Ambrosia Salad! Sliced on a plate with hunks of Sharp cheddar cheese! In a pie topped with French vanilla ice cream! In a smoothie along with cantalope and strawberries! Pear-sauce on top of waffles or pancakes with homemade whipped cream! Ohhhh….the ways are deliciously endless! Thank you for reminding me of some of them. And thanks for the giveaway!! Tweeted about this giveaway on Twitter. It might be a split decision for me. I love a good pear, goat cheese, walnut, spinach salad, but I am also a big desert fan, so a pear torte is on the top of my list as well. And I love pears just the way they are and also I love to make Pear Bread and Pear Sauce…yum!! Love to eat pears as a fresh fruit!! !Sometimes as a topping for yogurt. Shared the giveaway on Facebook and twitter! just the way they come!!! My favorite way to enjoy fresh pears are with cottage cheese and a lettuce leaf and a sprinkle of shredded cheddar on top! I like my pears naked. The pears, not me. 😉 And I followed all instructions above. Thanks! Best way to enjoy them is raw!! Au Natural! Just the way nature intended. Shared on my FB page and liked already. I make a yummy baked oatmeal with pears – great for a lazy Sunday morning in fall. i love eating the pears just sliced and by themselves! Nothing better than a perfectly ripe pear!! Better than candy! Looks like I am in the majority – plain, by themselves, is best! I would love to try your pears! Pears are seasonal around here and during the winter months I only get to have canned pears. I shared the link on Facebook! Thanks for the chance to win! I love to eat them on the go! There is nothing like a fresh pear straight off the tree. Since I don’t have the tree, then to have them in a bowl on my dining room table and eat them as a snack in the evening while watching TV. Sweet, ripe and just plain delicious. I love to juice fresh pears and they are delicious in muffins! As a vegetarian, pears are one of my “go to” fruits. I like them straight up out of the box, no cooking required. For health benefits fruit can be your secret weapon for weight loss and cholesterol control. Love em! I like pears in salads with lettuce, cheese, walnuts, and apples. Yummy! Simply chopped up along with Peaches, Strawberry, and Grapes for a wonderful Fruit Medley. I like you both and received your newsletter. my husband and I both love to have a sweet juicy pear as dessert after a warm fall dinner. I like fresh pears as is! No need to add any extras for me. I love fresh pear slices with a little Nutella for a super yummy dessert! I like both your fb page and USA pears…I subscribe to AFH newsletter. I also shared this contest on my facebook page. My favorite way to eat pears is sliced up fresh…I heard from an acupunturist that pears are good for the lungs…so I eat as much as I can get. LOVE THEM!!! My favorite way to eat pears is straight up fresh plain. I love them slightly crunchy!! Sliced thin on pizza, YUMMERS!!! I like pears as they are but I have been known to make a spicy pear syrup- great over waffles or pancakes. I just like them sliced and slightly crisp. they just ooze goodness! I eat my Pears ripe and fresh. I love to eat fresh pears just the way they are and at room temperature. Also, I will eat them along with cheese and my favorite cracker. Have always just loved eating pears out of hand. Nothing better. I always have pears on hand for snacking or baking. 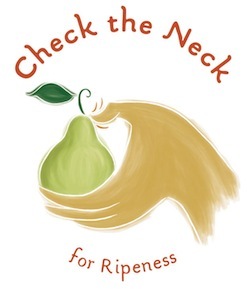 I like your tip about gently pressing the neck to determine how ripe it is. I love pears sliced on a salad with blue cheese and nuts. Or, topped with cottage cheese. Love pears – just sliced and raw – dont tamper with perfection! I love pears poached drizzled with fig sauce, or honey; baked with cinnamon; sliced thin in a salad;made into a tart, turnover, or a pie. They also go very well with soft cheeses. There are different varieties, each with its own distinct flavor, which can range from sweet to tangy. The skin can be buttery, crisp, or everything inbetween. I love all types of pears. I love pears at room temp with gouda cheese, or sliced on top of cottage cheese on bed of lettuce. I also like USA pears on FB and am subscribed. I love pears right from the fridge, while they are still cold! I like to eat pears in a German-style pancake. Pears are delicious no matter what you do with them! Try them sliced, warmed up with cinnamon and a little agave syrup—delish! I just ate a pear today. It is a great afternoon snack. Holds me over until dinner time. I signed up for your newsletter and like USAPears on FB . Pears are one of my favorite fruits. I love them in salads with fresh nuts. I also love them baked with a little cinnamon and brown sugar. One of my favorite snacks is spreading laughing cow blue cheese wedge on thin sliced pear. So good. Also enjoy pear in grilled sandwiches with Turkey and provolone cheese. Baked pairs with cinnamon, raisin, and pecan filling, topped with fresh whipped almond cream. I love grilled pears drizzled with a light balsamic vinegar. It’s the perfect compliment to any meal! I like chopped bake pears with cinnamon and sugar and just a crisp, sweet,plain pear by itself for a good snack!!! My favorite way to eat pears is fresh. I also shared on Facebook, Pinterest, Twitter and Google+. I like just to enjoy the taste of a plain fresh pear – especially if it is picked right from the tree! I am going to have a houseful for Thanksgiving. I love making salad with fresh pears and walnuts. I like leaving a fruit bowl on the table during the day, filled with apples, oranges and pears. It’s a great family snack! I love a good pear salad with walnuts! And even poached pears with homemade vanilla bean ice-cream! pear tarlet with a carmel glaze…….will post pic if win!!!!! plain, just the way they are. I love to eat them at room tempature and cut up apples with the. Love them plain. So juicy and sweet! Oh wow – a lot of people have some amazing ideas! Sauce on pancakes?? Trying that for the kids for sure. Normally I just enjoy them out of the fridge – but a pear pie, using an apple pie recipe… I think I am going to have to try that for Thanksgiving! Thank you for the chance to enter, I posted on FB and on my FB page, Our Cheap Tricks! Nice and ripe sliced on a plate! I like you both on facebook and signed for the newsletter. My chocolate pear muffins are devine! Sprinkled with cinnamon and topped with a little vanilla Greek yogurt, honey and low fat granola. Pears are one of our family’s favorite fruits; we always enjoyed them around Thanksgiving time as my mom would always have them in the fruit bowl. There is nothing better on a cool fall day than taking a bite out of a raw, ripe pear. fresh is the best, let the juices drip. yummy. I love pears in my oatmeal with cinnamon. I shared this on facebook too, thanks for all of the info you girls give!! I absolutely LOVE pears in any thing or oh so delicious all by themselves. Pear pie beats apple pie any day! Would love to win and I’ve shared with friends and on facebook as well. There are lots of things you can do with pears but my favorite it to just eat a fresh pear. I’m craving some pears especially because most of the summer fruit is gone. I like to eat pears onthe side ofmy morning oatmeal. I eat them fresh, and I saw this contest in the Appetite for Heath newsletter! Love ;pears in a salad with candied walnuts or pecans and really good blue cheese! I love to eat my pears fresh! Especially as fuel pre-workout. Thanks! I shared on facebook and tweeted this giveaway too! I like USA pears on FB, am signed up for the newsletter and like my pears on salads especially with feta and walnuts. Thanks for the chance! I forgot to add I shared on fb & twitter that is all I can handle! I like my fresh pears warmed up slightly with a little sweet cream on top! Feels like living the “royal” life! I prefer to eat my pear fresh! Occassional I’ll slice them up and dip them in a marshmallow dip, but mostly just eat the fruit whole. Pear-tinis are the best! The Starkrinsom are fantastic when I saute with butter, brown sugar, and ginger, and serve over ream-cheese stuffed French toast. Red Anjous are exquisite in a spinach/almond/feta/grapenuts salad, as well as roasted with my bourbon-glazed pork tenderloin. YUM! I hollow out a pear, put in small amount of butter, brown sugar in the raw and add nuts an bake in the oven….tastes amazing! I am subscribed to your newletter, like USA Pears on Facebook as well as Appetite for Health on Facebook. Great giveaway! Thanks! There’s nothing better than a good ripe juicey pear!!! I’ve never won fresh fruit, however it would be awesome to win these Pears!!! Thank you for the opportunity!!! I make a really good Pear and Cranberry Galette and that’s how I like to eat my pears in the fall and winter months. I especially like them in harvest salad! Or to be simple, just get some puff pastry, embed slices of pear in the tart, bake it and sprinkle with powdered sugar!